Passenger side stub axle has excessive play/slop. U joint assembly can be moved about 3/8" side to side. I can grasp the tire at 3 and 9 o'clock and move it and see the axle move. This effects the handling of the van also. Forgot to state, this is a 64 differential. Possible the internal splines are worn in the yoke. Been there, Fixed that. Folks often forget to re-install the bolt/washer retainer on the axle after they tap the yoke back on. Many miles of micro-wear later and the soft iron of the yoke gets worn away. Wish this was the problem. I did have a worn yoke on my Rampside but not the case on the van. I have the axle out and can insert other assemblies into the differential and they all are loose in the same way. It seems like the play must come from the side gear somehow. Either the inner yoke is worn or the differential carrier is worn where the yoke slides in and out. I guess the side bearing could be shot but that should make noise. I have changed the yolk half that fits the differential to get some slop out. Friend’s 63 in Maryland would not pass inspection because of it. Changed inner yolk half and it passed. Most times it is ignored. The other part to change is what that yolk half rides upon. Of course that is differential tear down time. I rebush the carriers to eliminate that play. Here is a remade late carrier to work in an early getting that fix. Ken, I think you have identified my problem. As I have to pull the pack anyway I will install the spare. Thanks for the tip. Maybe a cool fix to stop yoke seals from leaking? Keep in mind that there is always some slop when the car is jacked up and the suspension hanging. 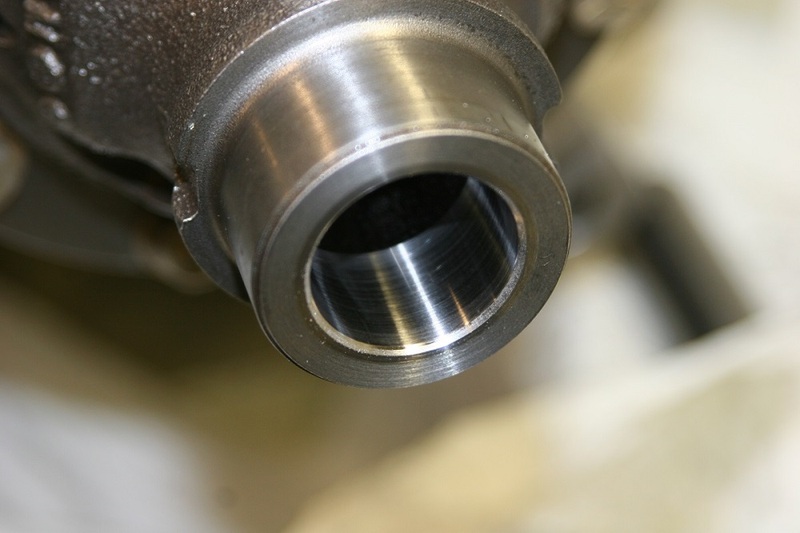 The axle comes out of the side of the diff some so that there is less engagement and more slop. There is always a little slop even when the car is sitting on its tires. 3/8" slop sounds like more than normal with the wheels hanging, but most cars I have worked on have around 1/4" of side travel when the suspension is hanging. How much is normal in this situation I really do not know (perhaps they are all worn). Ken, when you remachine the carrier, what it the measurement spec that it is bored? The factory spec is 1.1575 to 1.1595. 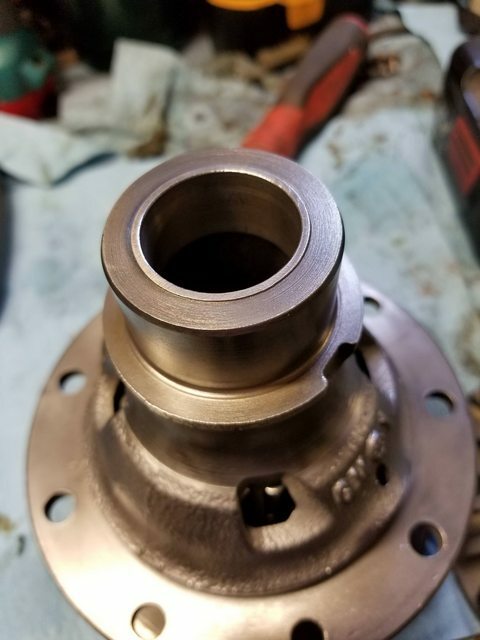 The bore will shrink .0005 when the bearing is installed so I shoot for the middle of that spec when installing the bushing. > measurement spec that it is bored? Since the parts are not new anymore I also want the drive yoke and I fit the bushing to the yoke. 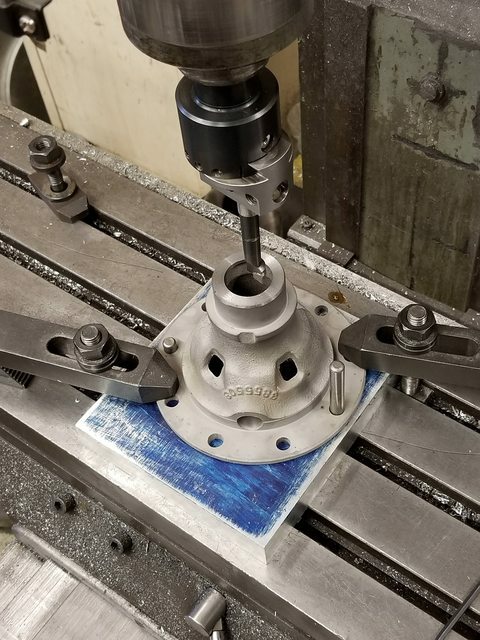 I also do the final fitting with the bushing installed and I try for the closest fitting that will allow the yoke to slide full travel and that is generally around .005". Like I said I don't just bore to a number I hand fit each one.